Can the EUETS combine intensity-based and absolute emissions caps? 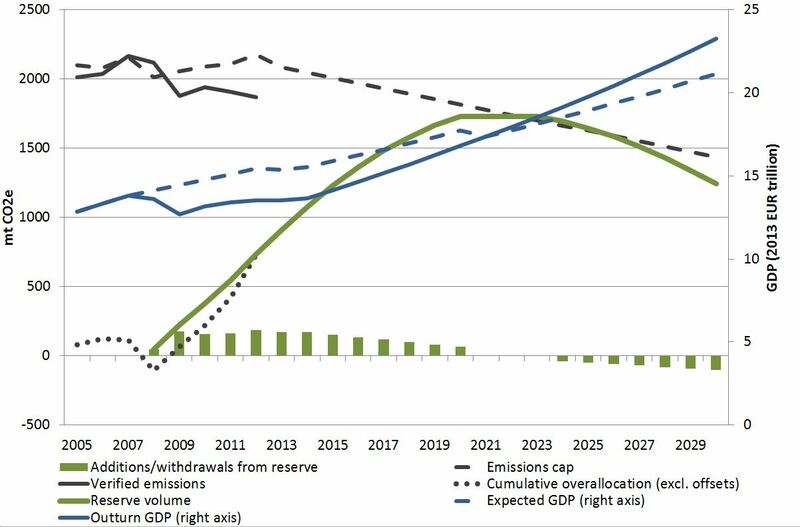 An innovative reserve mechanism for the EUETS is being considered that moves allowances to and from the reserve based on the level of economic activity. This would give the EUETS elements of an intensity based cap (limiting emissions per unit of output) within an absolute cap (limiting total tonnes emitted). Although potentially less economically efficient than managing reserves based on prevailing prices it may prove politically more tractable. The prevailing surplus of allowances in the EUETS is leading to the scheme lacking effectiveness as a signal for abatement, and especially for low carbon investment. The EU is considering a range of reform options to address this. One option is to cancel allowances currently due to be auctioned, although this is likely to face substantial opposition. Another option, not mutually exclusive, is to establish a reserve of allowances to stabilise the market. Options for the reserve now under discussion are all volume based, as they seek to stabilise the market by using a reserve to manage the volume of available allowances. But they differ in the basis for the trigger mechanism used to determine the timing and number of allowances transferred to or from the reserve. There are three main types of basis for a trigger mechanism: volume of allowances, levels of economic activity, such as GDP, and allowance prices. I assume here that the mechanisms applies automatically, but it would be possible for it to be administered on a more discretionary basis, analogously to the types of functions performed by a central bank. I have previously written about the advantages of allowance reserves that use price based triggers to implement soft floors and ceilings on the price, such as those already implemented in California. However, even if such mechanisms represent the best way forward in principle they may prove politically impossible to introduce in Europe at the moment. So what about the other two possible types of trigger? A volume based trigger in which allowances are put into the reserve when the cumulative surplus exceeds a specified upper threshold, and moved back into the market when the surplus (although still present) falls below a lower threshold, is essentially a form of temporary set-aside. If allowances thus automatically come back into the market as it tightens, the timing and extent of the market’s return to cumulative scarcity appears likely to remain largely unaffected. Market participants will anticipate the return of allowances to the market and factor it into their pricing. Such a mechanism thus seems unlikely to add significantly to market stablility. An economic activity based trigger is quite different. It seeks to make the supply-demand balance more stable by adjusting the supply of allowances in response to the level of economic activity. Allowances are placed into the reserve if economic activity is lower than expected and withdrawn from the reserve if activity is higher. This can result in supply being reduced into the long term after a recession, because allowances only come back into the market when a period of higher than expected economic growth leads to economic activity above expected levels. This may not occur, or may return only a proportion of allowances. It turns the scheme into something more like an intensity based scheme, where emissions per unit of activity are limited, but in this case still subject to an overall cap. Such a mechanism does not address all of the causes of over or under supply. Consequently it may not prevent price falling very low or rising very high in some circumstances, and so inefficiently low or high prices remain a possibility. However a price-based trigger would probably be needed to avoid such risks completely. This type of mechanism requires the measure of economic activity used as a basis for the trigger to be defined. This may be GDP, which measures (however imperfectly) activity in the economy as a whole, or it may be something that represents activity in the sectors covered by the EUETS, for example a mix of electricity consumption and industrial output. The expected level of economic activity that corresponds to no transfers to and from the reserve needs to be set. It will likely be appropriate to reset this from time to time to take account of changed expectations, at least at the start of a new phase of the scheme. The number of allowances that are transferred to or from the reserve in response to changes in the level of economic activity (elasticity) also needs to be defined. For example if economic activity is 1% lower than expected then 1% of the cap may be put into the reserve, or some other proportion such as 0.75%. The response may include limits on the number of allowances transferred in any one period, for example a quarter of auctioned volumes in any one year. And it would be possible to specify no transfer in the event of small changes in economic activity relative to the expected level. The way that such a mechanism might have worked had it been in place since the start of Phase 2 is illustrated in the chart. For simplicity it uses GDP as an indicator of economic activity. Expected GDP at the start of Phase 2 in 2008 was 2.3% p.a, with rising economic activity over time (dashed blue line). Actual GDP has been well below this (solid blue line), and is currently around 12% below expected levels. This leads to allowances being put into the reserve (green bars and lines which show annual and cumulative totals, assuming an elasticity of 0.75). This is close to the cumulative surplus due to lower emissions shown on the chart (dotted black line). The surplus is defined as the difference between the annual cap and actual emissions (dashed and solid grey lines), and excludes any surplus due to other factors such as the use of offsets. In a hypothetical future the reserve continues to grow as GDP remains below expected values. Then, after expected GDP is reset at the start of Phase 4 in 2021, a period of more rapid than expected growth begins to reduce the size of the reserve. However a large volume allowances remains in the reserve even though the cap has significantly tightened and the market is likely to have returned to scarcity. It is not clear whether or not such a reserve mechanism, in effect providing an intensity based limit subject to an overall absolute cap, is a good idea. It may fail to meet policy objectives in some circumstances, and other options for reform may be preferable. But it seems worth further consideration. If nothing else it may at least help remove at least some allowances from the market if permanent set-aside (cancellation) of allowances is not politically feasible. And as an innovation among emissions trading schemes it could go some way to restoring the reputation of the EUETS, and would provide a signal to others around the world that the EU is willing to take action to address the problems with the EUETS as it now stands. To follow this blog click on the button in the bottom right hand corner of the screen. This entry was posted in carbon pricing, Climate change policy, emissions trading and tagged carbon pricing, emissions trading, emissions trading scheme on 24/10/2013 by adamwhitmore.